Targeting Cancer ambassador Julie McCrossin has called for national education guidelines to develop best practice treatment for head and neck cancer patients. 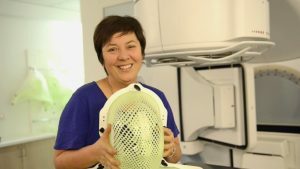 Former ABC presenter Julie, who successfully underwent radiation therapy and chemotherapy treatment for head and neck cancer, has also called for the development of a bigger team of specialist head and neck cancer nurses to provide the best support for Australian patients and their families. In the blog, entitled ‘The Mask and How to Help’, Julie outlines her own experiences of treatment, including wearing the mask that is used to hold the head in a stable position while she received radiation therapy treatment. Julie said the experience of wearing a mask for the first time can lead to ‘psychological trauma’ for patients, particularly when they receive little information beforehand about what to expect. “Currently, there is a wide range of inconsistent practice,” Julie wrote. “The opportunities for professional, evidence-based pre-treatment education vary – not only between cancer centres, but within the same centre, depending on which staff member happens to be on duty. “When I asked my team why I had not been told what to expect with the mask – everyone thought somebody else would have told me. This hit-and-miss approach is leading to psychological trauma. Every other aspect of my care was professional and evidence-based. Targeting Cancer ambassador Julie McCrossin is calling for better support for head and neck cancer patients. Julie also outlines her recent meetings with UK head and neck cancer nurses and how their Australian counterparts must be given more support and training to inform patients ‘before, during and after the treatment process’. The full blog can be read here, courtesy MedRadResearch. For more information on Julie’s experiences as a head and neck cancer patient, click here. For more information on radiation therapy and how it can be a curative treatment for cancer, click here.